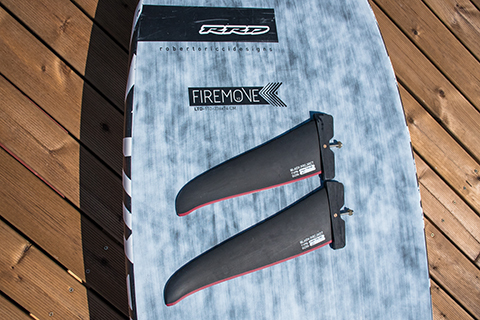 I have previously highlighted one of the greyer areas of our sport is the tuning of our kit, so with spring coming I examine how to get the very best out of Freemove (FM) boards. I will examine what we can change to extract better performance across a range of conditions and levels. 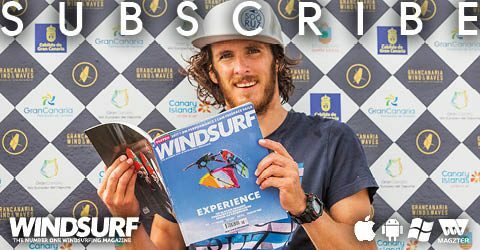 (This feature originally appeared in the March 2018 issue of Windsurf Magazine. To read more features like this first, Print and Digital subscriptions are available. On my Coaching clinics I teach basic tuning straight away; board setup and making easy changes to the rig, like boom height or outhaul tension. 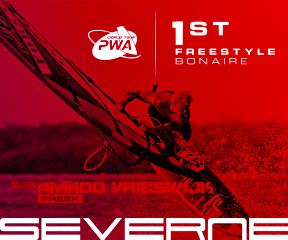 This commences the independence and experimentation we need in order to be masters of our own windsurfing destiny. This actually starts before my clinics with an email to say bring some smaller / spare fins for example, so already my clients are thinking about how the fin can affect the performance of the board and the effect it has on the rider. It also means they have to change their sails and boards less too, so more time on the water in fab conditions on their holidays! Please remember my recommendations as to what to tune, and how, are a guide. In tuning the goal is experimenting to find out what works best for YOU, and your specific kit! When you improve in your tuning you start to believe in your kit more and this also manifests itself in renewed confidence on the water too. 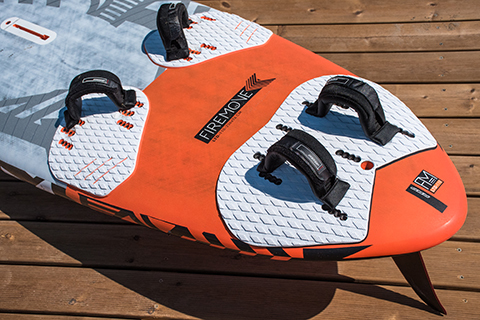 This feature covers the FreeMove (FM) boards as they are now readily available in many windsurf centres and many of you own them. Plus they are now relevant for not only advancing intermediates but also for aspiring advanced improvers and lower intermediates as they make so many moves so much easier to achieve. • Footstrap size – I have reinforced the fact that big (generous) is beautiful and that it is a ‘footstrap’ and not a ‘toe strap’. 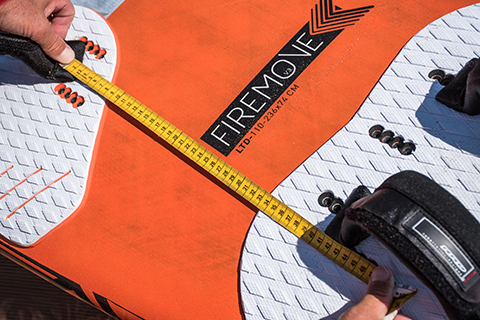 Bigger footstraps help you slip your feet in and out smoothly, carve the board and lastly improve your wind range. • Footstrap position – Changing the position helps us to make our boards more comfy for our own stature, and it also allows us more control over the board or furthermore to prioritise speed over moves, or places them in a more suitable position for your ability. No 2 brands have the same spread between the front and back straps, so a tape measure is the truth and your friend. The choice of inboard, middle position or fully outboard will be presented in the picture captions. • Mastfoot position – This is an easy change and can be performed both in and out of the water. It can yield a huge difference in performance. Moving it controls the pitch of the board; essentially nudging the mast foot forward locks the board down and bringing it back lifts the nose. Find your 130cm point (distance from the tail) and mark it. Note some brands have this marked already, but it is worth double-checking. Again please experiment to find an all-round setting and move the mastfoot fore and aft by a cm or 2 – no more. • Fin Size – On these FreeMove boards you could find yourself running with 3 different fins to great effect, 2 is more common. 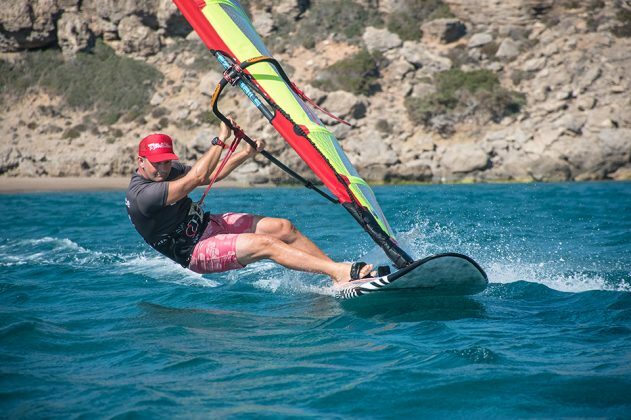 Increasing fin size ups the lift and assists early planing, upwind sailing and also provides greater lift at slower speeds, which is important for riders who are learning footstraps or developing their board speed. Decreasing fin size lessens the lift and helps the board to become more controllable and manoeuvrable. Some brands have huge fins in their boards that once you are at a certain level are just too big, and sizing down will really help you. An added bonus of riding with a slightly smaller fin is that it will improve your skills and make changing down board sizes less of a challenge as you progress. Last point to consider is that changing your fin can be almost like changing your sail size up or down! • Situation: The rider is sailing in and the board’s nose is looking to rise, alongside the windward rail getting a bit unwieldy. They may also be getting ‘dragged’ upwind as the board resists being turned downwind easily. • Solution: They are overpowered – and / or their fin is too big. Options are to increase outhaul and size down the fin in order to decrease the fin lift and help the board become more controllable and become easier to steer. COACH NOTE: Pull down on the boom, flex the back leg and drop your elbows to add technique to tuning! • Situation: A rider is looking to get planing and get upwind and the board will not get up and go, or it is just on the edge of planing. • Solution: They need to upsize the fin as the wind might have dropped or their sail size is too small; changing from 35 to 40 cms (up 5 – 8cms) can make a big difference. This will give them easier planing and upwind ability. They may have already let off some outhaul, so the upsize is the next tuning change to consider. COACH NOTE: Technique is also key here; pull down on the boom and bend the back leg and bear away to plane earlier! • Situation: As someone is coming in to gybe I note they are struggling to scissor (steer) their board downwind and also throughout the carve they have problems holding the carve, i.e. keeping the rail engaged. • Solution: Their fin is likely too big and they have neglected to change their fin down as the wind has increased. • Situation: A rider is flying around in a fast, great stance but the board is not at the speed it should be and is catching chop around the shoulders (in front of the mast foot). • Solution: Modern boards, and FreeMoves in particular, are just so well behaved that sometimes they are just too flat to the water and we need to release them. In this instance it is best to move the mast foot back. The rider may have also fallen for that old tuning classic of ‘put it in the middle.’ Note that sometimes your best mast foot setting may be at the back of the mast track. COACH NOTE: If you want to sail faster and improve more whilst getting more response in carving moves then start bringing your mast foot back and aiming to sail with a smaller fin. • 7.0 on my FM 110 (74cms wide). 7.0 x 5 = 35cm. This is a few cms below stock fin size of 38cm so this is great for me when well powered up, and in line with my ability. However, if the wind is lighter I size up to a 40cm due to needing more lift. • 8.0 on my FM 110. 8.0 x 5 = 40, but with the power of the wind being a lot less in lighter winds, and me being heavy, alongside the board speed not being as quick I will size up to a 45cm fin. • 5.8 on the FM 110 = 29cm. I need less fin and I am looking for the smallest fin my 74cm board can handle. I cannot just size right down as these wider tailed (bigger) boards do actually require a minimum amount of lift. This will be a 30 / 32 cm and I am currently testing / tuning to discover which. • 7.5 on my FM 110 and very well powered up and I want to go as fast as possible will see me sizing down to a 35 or even a 32cm fin even if my calculator says 37.5cm fin will work. As I am well powered I have plenty of lift and if I want to go fast then being over finned will really slow me down. TIPS: ‘The strap spread that works best for you comes from your stature and preference. Measure from the back of the front footstrap screw to the front of the back footstrap screw. As a guide the range is around 38-44 cms. Shorter (height and/or leg length) riders suit a narrower spread and taller riders go wider. For a point of reference this might be the front strap being on #2 hole (from the front) and the back one on #4 (the very back hole) for me, as per the picture with my straps in the middle set. The shorter rider can bring the front strap back and / or bring forward the back strap. Experimentation and knowing the measurements are key. out – check out his fab new site www.jemhall.com for details. You can also follow him on twitter / Facebook / Instagram.